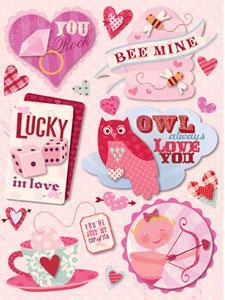 Sweet Talk Create-a-Card Kit. 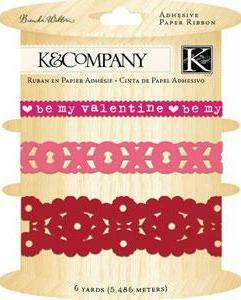 Kit contains die-cut cards envelopes and embellishments to create whimsical Valentines cards. 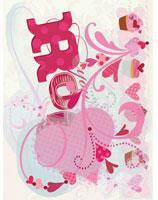 Let your creativity take shape with beautiful acetate die-cuts! Just choose your design and adhere as you see fit. Sweet Talk Lots of Love Pillow Stickers. These are puffed holographic-foil embellishments and are shiny and dimensional. 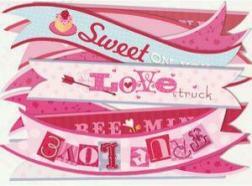 Sweet Talk Adhesive Paper Ribbon. 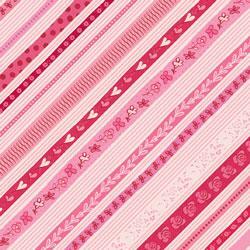 Each ribbon pack includes three different coordinating designs 24 inches of ribbon per design. These acid-free lignin-free die-cut stickers are beautifully embossed to add a subtle dimension to any project. These acid-free lignin-free dimensional stickers are remarkable for their beauty depth and versatility. Every Grand Adhesion sticker is made of three stacked layers. Metal embellishments stand the test of time and Brenda Walton metal art is no exception. 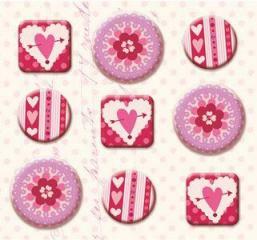 These fabric-covered brads detail the colours and patterns of the Sweet Talk line. 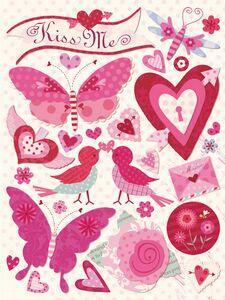 Sweet Talk rub-on transfers are easy to apply and designed to add romantic detail without muss or fuss. 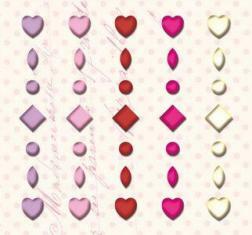 Rub-ons are embellished with gems. Die-cut Mat Pad. Just mount a 4x6 picture in the center for an instant mat. 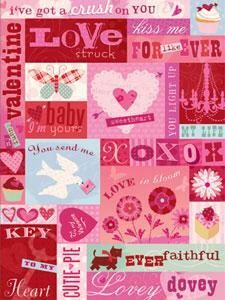 The Sweet Talk pad includes 18 sheets of double-sided cardstock mats sized 4.75 x 6.75. 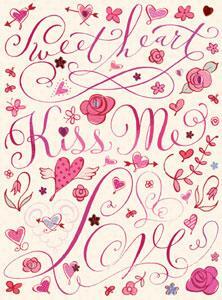 12" x 12" Speciality paper form the Sweet Talk collection. 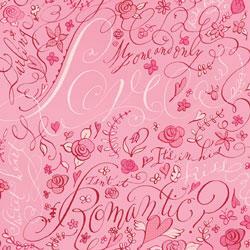 Words of Love Embossed Foil Paper is embellished with a layer of shiny foil and embellished with a subtle dimensional texture. 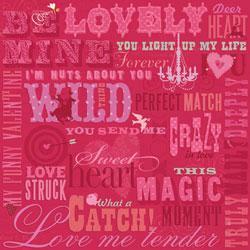 12" x 12" Speciality paper form the Sweet Talk collection. 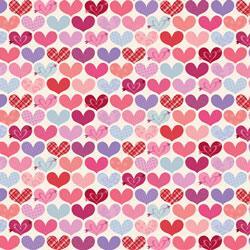 Pattern Hearts Glitter Paper is embellished with sparkling glitter. 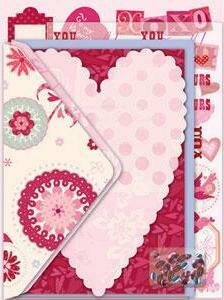 12" x 12" Speciality paper form the Sweet Talk collection. 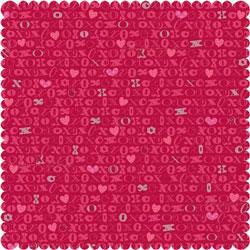 Hugs & Kisses Die-Cut Frothed Paper is accented with a soft frothy texture and is intricately die-cut to add a touch of elegance to any project. 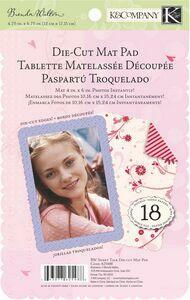 12" x 12" paper form the Sweet Talk collection. 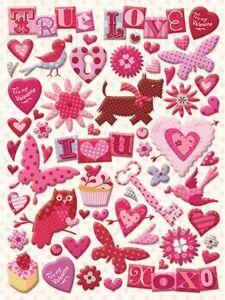 Cute and cheeky its the perfect way to tell that special someone I love you! Papers are acid- and lignin-free.